A few healthier options for you to enjoy whilst watching the footie! Scoop some peanut butter and place on one slice topping it off with a second slice of banana to make a “sandwich”. Melt the dark chocolate in a heat resistant bowl above a pot of boiling water. 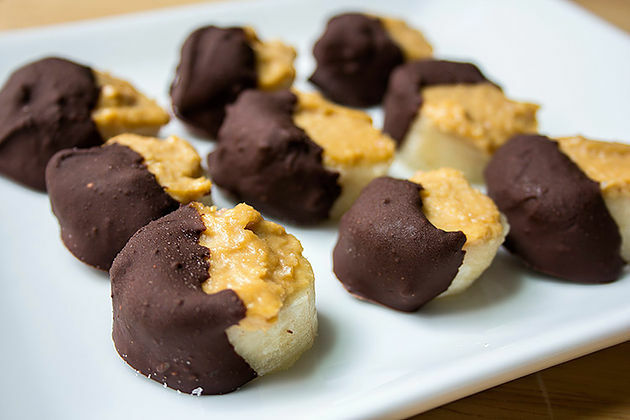 Set your banana “sandwiches” in a dish and drizzle the melted chocolate over the top. Pop into the fridge for an hour till chocolate has set. 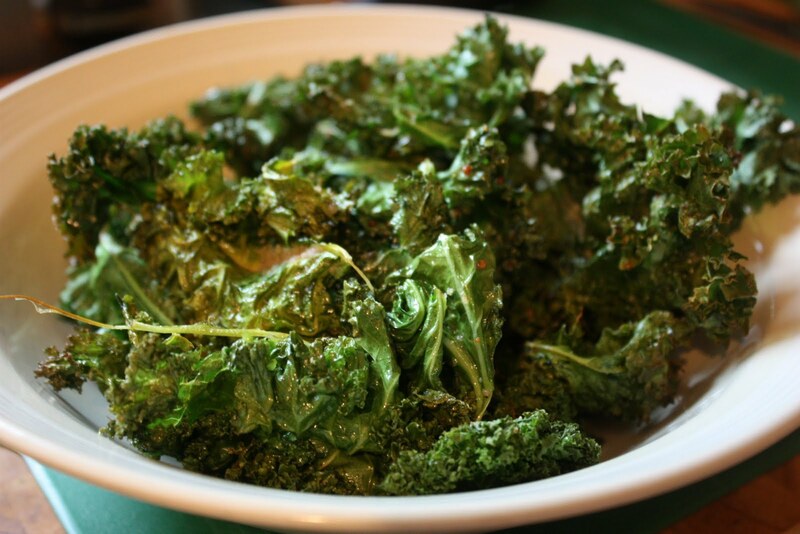 Tear the leafy part of the kale from the husk and place – spaced out – on a covered oven tray. Spray with low calorie spray (you can use melted coconut oil but it’s harder to coat the kale). Season with spices of your choice. Turn off the oven and place the tray inside to sit in the heat for 5-6 mins. Keep an eye as they can burn quite quickly. 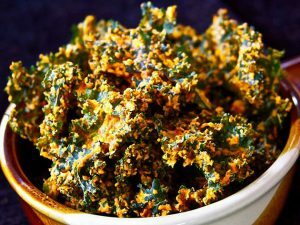 Once the kale has become crispy it’s ready to serve! 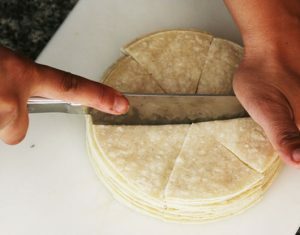 Cut up the tortilla wraps into small triangles and place on baking tray. Using a pastry brush, lightly coat each chip with some extra virgin olive oil over them and season to taste. Place in a preheated oven at 180C and bake for 10 mins, turn over and bake for a further 7 or until golden brown. For the salsa: Add all ingredients for salsa together into a blender and blend for a few seconds. Alternatively if a chunkier salsa is preferred then all ingredients can be chopped and mixed together without a blender. For the guacamole: Scoop out avocado from rind. Mash into a paste using a fork. Add in chosen ingredients like onion and herbs etc. Then add in the lime juice and salt to taste. Place a layer of tortilla chips onto a serving plate; add some salsa, guacamole and a small portion of reduced fat grated cheese or mozzarella. Place under grill for 5 minutes or until cheese is melted. Place a second layer, repeat and serve. Line two baking trays with grease proof paper. 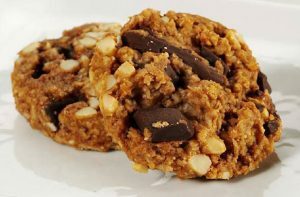 Mix oats, flour, flaxseed, cinnamon, baking powder in a large bowl. In a smaller bowl mix agave, egg white, almond butter, vanilla essence. Add wet mixture to dry ingredients mixing well. Add crushed chocolate and nuts. Separate onto grease-proof paper flattening down each cookie bite. Cook for 9-10 mins till golden brown. Cool on a wire tray for ten minutes. For more food and fitness tips follow me on Instagram, Facebook and Twitter. 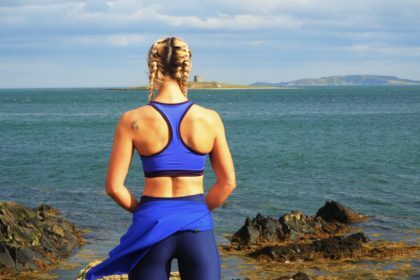 Are you looking to TRANSFORM in just 6 weeks?